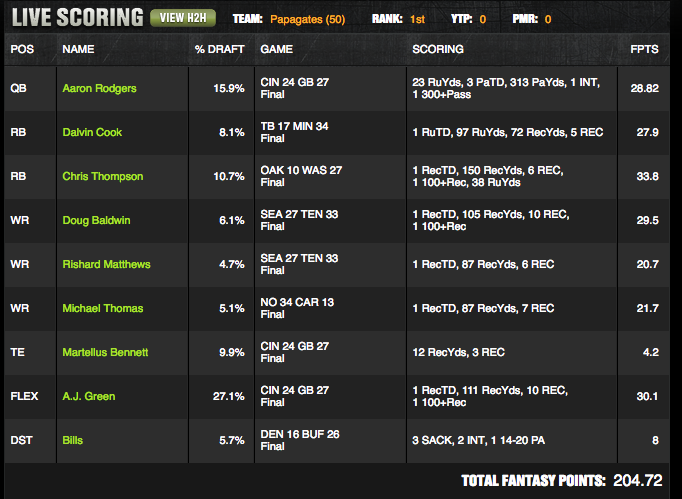 Of course, Drew gives me the lineup recap responsibilities on the bad week, while he takes glory the week prior. I'm onto you Drew! Jokes aside it's arguably more important to go through our processes on bad weeks to determine where we went wrong and where we just got unlucky. A huge part of NFL DFS Strategy is understanding when you went wrong in the process and when you went wrong in the results. This week I want to focus on my three WildCat entries. While this is an MME tournament (150 max entries), the total contest size (5,5457 spots) and higher entry costs that reduces people max entering make this work more like a 3-max tournament than a MillyMaker type tournament. I've received an array of questions on how to approach such tournaments, and I know this is the type of tournament that often doesn't get enough content dedicated to it across the industry. Content can be driven mostly to A) cash games or B) the massive field MME tournaments. Process decisions should be broken down into two types: A) Roster Construction and B) Player Evaluation. Last week in the Wildcat, my focus was on the high total games of NE-NO and GB-ATL. It was easy then to make three distinct high correlation teams, double stacking Tom Brady, Aaron Rodgers, and Matt Ryan, and having a player coming back the other way from the opposing team. This week was much more challenging to decide how to construct my teams for two reasons, given better DK pricing and less allure of high-priced QBs (although a Tom Brady double stack ended up working out pretty darn well). On Sunday morning, I felt like my Rodgers stack with AJ Green coming back wasn't done with the proper motivations. I felt it was a stackable game, but it was going to be a somewhat chalky stack with expected high ownerships on Davante Adams and AJ Green. And an expensive stack as well. Not all expensive chalk is bad. 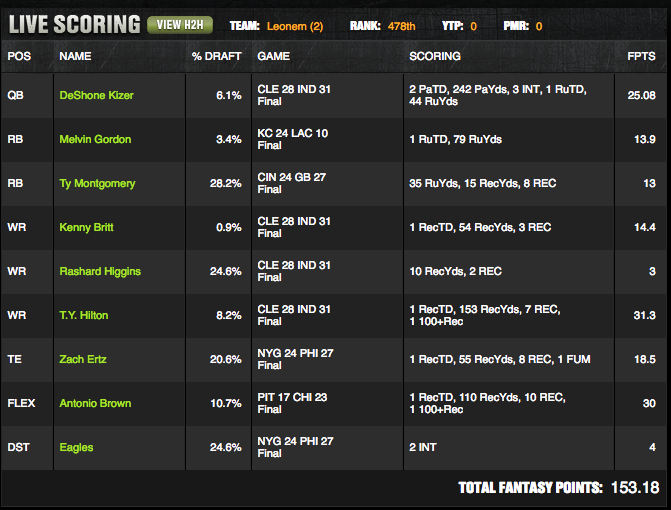 AJ Green had a massive game, putting up 30.1 DK points. However, if you're someone that struggles to go “contrarian” in GPPs, the first place to start is fading high owned expensive chalk that you don't view as optimal. As a result, I pivoted to a second Kizer team. This was a good decision. We had Kizer as the top projected value QB on DK, but with low expected ownership. This also allowed me to have a different Colt coming back on the two stacks, Donte Moncrief on one and TY Hilton on the other. There were a lot of outs for Kizer, who takes plenty of shots downfield and has rushing ability, all against a bad Colts defense. Kizer, despite a bad real life game (3 INT), realized those outs with 10 Fantasy points on the ground. However, I made a bad process error by not changing Team Two, my original Kizer team, when I added a second Kizer team (Team Three). Since Kizer was A) cheap and B) has rushing ability, he's the type of QB you don't have to stack with a WR/TE in tournaments, let a lone double stack. The move to play Kenny Britt on Team 2 was a calculated risk - a sub-1% owned post-hype player with talent in a good matchup on a team where volume distribution was uncertain. I was determined to leave Britt on Team 2, but felt it was too risky to stack him again with Kizer on Team 3, so I went with a second Rashard Higgins. Had I figured out a pivot to Mohamed Sanu, who we liked much more than the market, over Higgins on Team 2, I actually would have squeaked by with a slightly positive ROI in the Wildcat. My final stack of Cousins-Pryor with Cooper coming back the other day never changed. The game had by far the highest total on the week and featured two buy low WRs with awesome athletic profiles and necessary volume in the passing game. Cheap access to the CLE-IND game. Two bad teams with low prices in what could be a shootout. Use cheap savings to afford expensive high volume PIT players - Le'Veon Bell and Antonio Brown. Ownership was going to be relatively tame here, and unlike some weeks where you need 40 out of their high price tags, 30 looks like it would get it done in tournaments. Spread out exposure to high upside, mid-tier WRs. Spread out exposure to high volume RBs, regardless of matchup. I accomplished all of these goals but did not get the desired results. Both Le'Veon Bell (PIT) and Antonio Brown (PIT) received the volume we hoped. Despite a tough day for the PIT offense (17 points), Brown and Bell scored 30 and 21.8 points respectively. These were the complementary performances to cheaper value I was hoping for on what shaped up to be a volatile week, and the ceiling was much higher for both players if the offense had been more effective as a whole. While the CLE-IND game featured some busts, the 31-28 score was exactly what we were looking for. 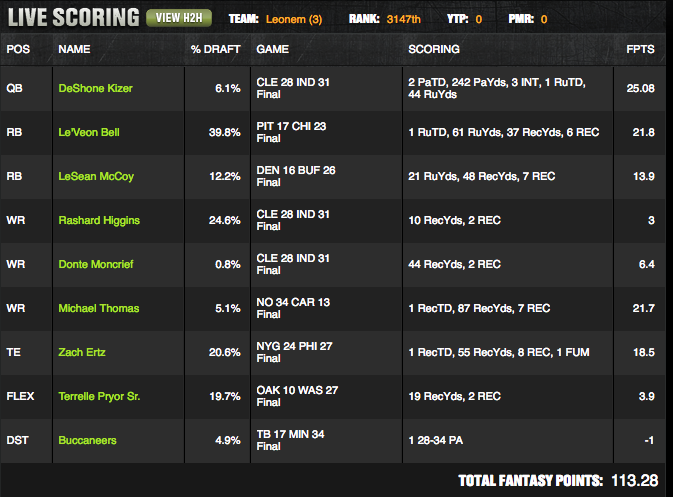 DeShone Kizer (CLE) and TY Hilton (IND) in particular returned huge per dollar value for Team 2, allowing me to cash. Zach Ertz (PHI) was on 2 of 3 teams I played. He's a talented player who continues to see steady volume (10 targets) at an otherwise volatile position. Alshon Jeffery (PHI) was one of my favorite targets all week. The news that CB Janoris Jenkins was active SUN morning immediately negatively impacted Jeffery's floor, but I still felt he was a strong tournament play and that the drop off in expected ownership was worth the increased volatility. Jeffery has a WR-1 build in terms of size and athleticism and was receiving high leverage opportunities (number one in air yards). With Jenkins on Jeffery, he saw less targets, a lower aDOT, and had limited success on the targets he did receive. Rashard Higgins (CLE) wasn't a bad play. His 11 target game last week, the injury to Corey Coleman, Kenny Britt's disappearing acts, and a matchup against the Colts made him a bargain for his price. However, the floor, clearly, was lower than we estimated. There were warning signs that this could go south - a poor athletic profile and a market share projection that was volatile. We simply didn't know what the Browns were going to do. Higgins finished the game with a 13% MS of targets. The WAS-OAK game was a train wreck for how I attacked it. My head is still spinning as to whether or not I should chalk this up to a poor decision or bad variance. Last week you got pummelled if you avoided the high total games; this week the WAS-OAK game came in 17 points below the projected Vegas total. 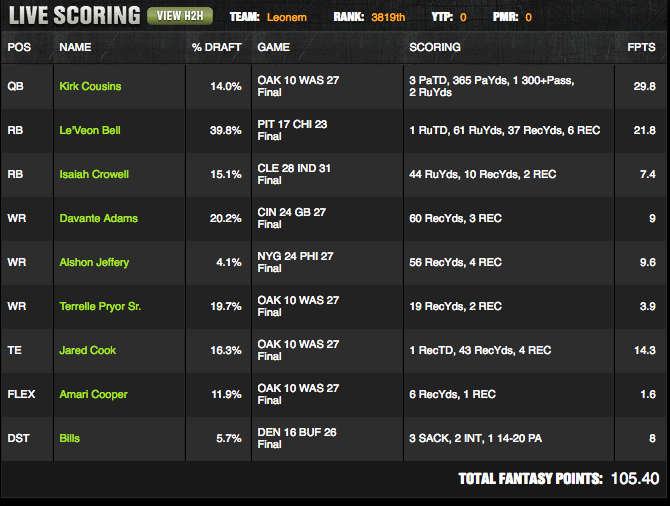 Even given the lower scoring affair, Pryor and Cooper underperformed. The RB position: LeSean McCoy (BUF) and Ty Montgomery (GB) received the workloads, particularly in the passing game, that lend themselves towards plenty of upside. Neither had an efficient game or was able to find the endzone, despite their teams scoring a combined 53 points. McCoy's inefficient/no TD game can be chalked up to a calculated risk in a tough matchup against DEN. Montgomery was stuffed from the goal line twice. It's not often you'll have two RBs combine for 15 catches and scored just 26.9 combined DK points. McCoy was a calculated risk on efficiency; Melvin Gordon (SD) was a calculated risk on health. We knew he came into the game questionable with a knee injury. While he ultimately disappointed, leaving the game early, Gordon's potential workload at 3% ownership is a good calculated risk. It nearly worked out as Gordon had a TD and was well on his way to the rushing bonus and likely some second half dump off receptions, but he only briefly played the second half. To add to the RB tilt, what we viewed as an overpriced Kareem Hunt (KC) quickly went from a good fade to one of the best RB plays on the week. Hunt accumulated 17 DraftKings points in Kansas City's last drive as they were simply running out the clock. It was a frustrating week. I think smart roster construction and trusting the value/upside of DeShone Kizer allowed me to recoup some money on a week where I got a lot wrong and a lot went against me. Avoided landmines at the skill positions utilizing some players like the PIT players or AJ Green but also not having exposure to any other RB I rostered outside of Bell. Had a big performance from a cheap player. My best cheap player was Kenny Britt, who had an acceptable but not tournament winning performance. Big games from Chris Thompson and Geronimo Allison, two players we were low on, set the top teams up for success. Big performances from mid-tier WRs. This one chaps me a little bit as I felt I set my teams up to be successful in this way. In fact, the Top 4 teams each had TY Hilton or Michael Thomas, who I rostered. However, Doug Baldwin's big performance landed him on the Top 3 finishing rosters, as he easily outscored my duds of Pryor/Cooper/Jeffery combined. Tight End didn't matter at all. Just as a general note, it was a good week for lower-owned talented WR1s who people were scared off by due to some combination of recent performance and matchup: Doug Baldwin, TY Hilton, Michael Thomas, and Stefon Diggs all turned in big scores. He interestingly only single stacked Rodgers, and was successful with it despite that pass catcher (Martellus Bennett) scoring just 4 points. Papagates essentially had two mini game stacks, with AJ Green coming back on the GB stack and Doug Baldwin and Rishard Matthews as opposing WRs in a game that ended up pretty up-tempo. Papagates finished laying the hammer down by absolutely nailing the RB position with Dalvin Cook and Chris Thompson. Cook was an underrated volume play at home. Thompson has been lucky with efficiency (YPT and TD%), but the upside was certainly there in a game where Rob Kelley was expected to be out and a potential shootout could favor the pass-catching RB of the remaining duo (Thompson-Samaje Perine).